Powered by a choice of inline-6 cylinder engines, including turbocharging, the BMW Z4 offers enthusiastic handling and features a foldable hardtop roof. BMW has introduced an all-new Z4 for the 2009 model year, featuring a folding hardtop roof and an optional turbo engine. Still dominated by a long snout, the 2009 BMW Z4 features smoother lines and a more aggressive front facia. 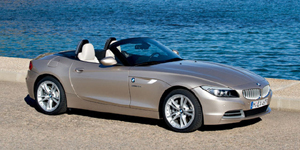 Find the used BMW Z4 of your choice from a dealer in your area. Search our used car listings now.